We decided to try their location on West 53rd and 6th Avenue, which seemed to be in the middle of a financial district. What’s great about this particular location was that there are these ledges / stone benches all around the area which would be perfect to sit down and eat with friends (if it had not been January and freezing). If you can’t get here however, don’t worry! There are plenty other locations as well which I’ll mention later. We had gone here after seeing a view of the city skyline at the “Top of the Rock” Observation Deck at the Rockefeller Center (review coming soon!) which is only a 3 minute walk away. Very much recommended! The line was gargantuan and it never ended. The cool thing is that even though many of the people in line were Muslim, most of them weren't. 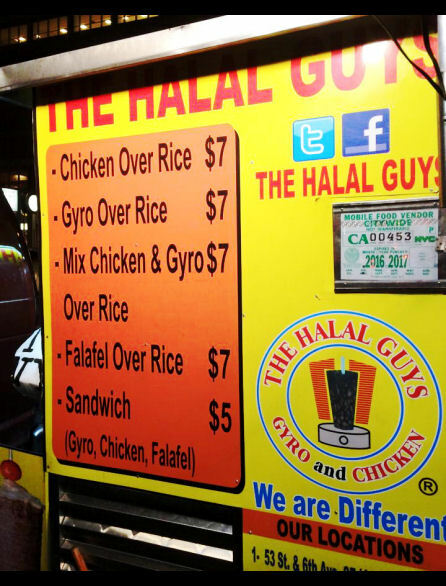 The Halal Guys is legitimately the street food of choice for New Yorkers of all walks of life. Excitement was building! As you lined up you could hear the perpetual clink clink clink of their metal spatulas as they tossed around minced lamb and chicken on their stoves. Their employees were all dressed in yellow branded sweaters which really gave you a feel of an authentic experience. These guys were working non-stop as the line never ended, cooking meat, chopping vegetables and bread, taking money and serving. It had a very professional vibe as far as street food goes. Alright let’s talk about the food. We decided to get two Mix Chicken & Gyro plates for $7 each which was a mistake because they were massive. 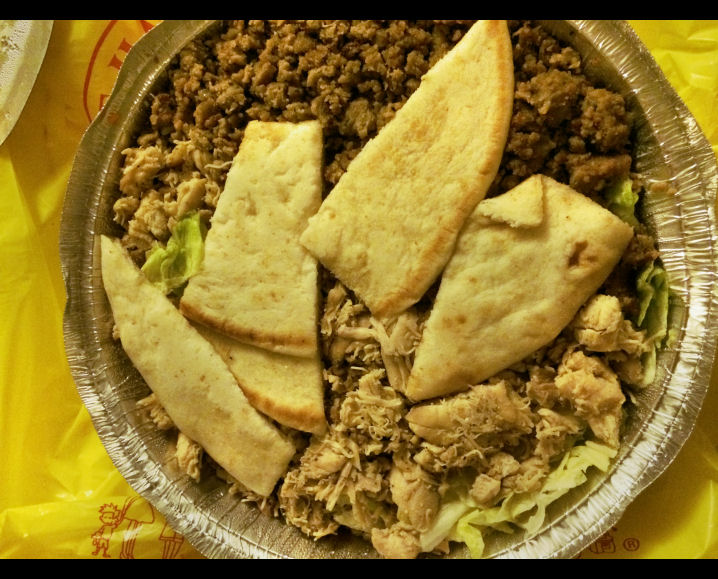 It came with minced chicken and lamb, a scattering of salad, a plain “orange” rice, and some chopped pita pieces. It also came with a couple of packages of “White sauce” and hot sauce, and if you asked for more they gave you as much as they want, which was pretty cool. About the taste – it was pretty good but I wasn't blown away to be honest. Everything seemed to be a tad under seasoned, but I still liked it a lot. Perhaps I was judging this to restaurant standards, but I had to remind myself that this was street food, and for street food this is probably the best I've ever had. What else do we have on the streets of Toronto that we can eat other than halal hot dogs? This is a massive halal lunch or dinner you can pick up on the street and probably share with another person. So in that regard, yes, this was pretty amazing. had come in little containers and tasted differently, but this was still pretty good. The hot sauce is REALLY HOT. This is coming from someone from Caribbean descent who knows spicy levels. If you like a little bit of pepper sauce with your meal but can’t handle the hottest levels that your mom and dad eat, DO NOT drench your food in the hot sauce like I did. That was a mistake. It was like one of those pepper sauces that didn't have much flavour, and just burns. I can’t comment on the Falafel over Rice or the Sandwiches, but the meat and rice plates were definitely worth $7, and probably $8 here in Canada. It was massive and filling, they didn't skimp on the meat, and it came with all the condiments you wanted. I heard they also have a few full-fledged restaurants in New York as well! 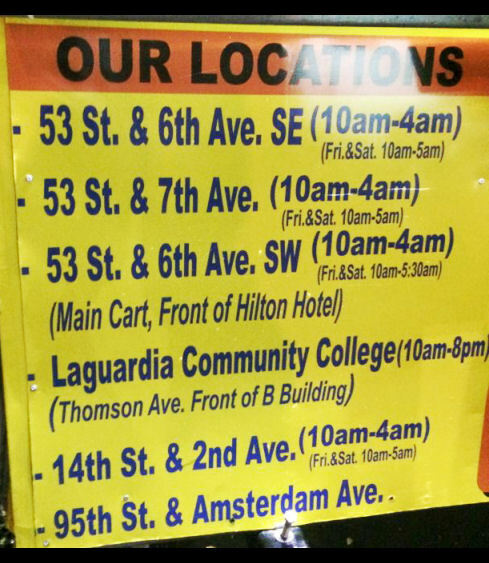 And 4am? I wonder if people hit up these carts for suhoor in Ramadan? After purchasing our food, we walked down the street to head to the subway and found this amusing sight. PLEASE NO HALAL FOOD HERE. At first I was shocked! How discriminatory for this Deli to ban Halal food! 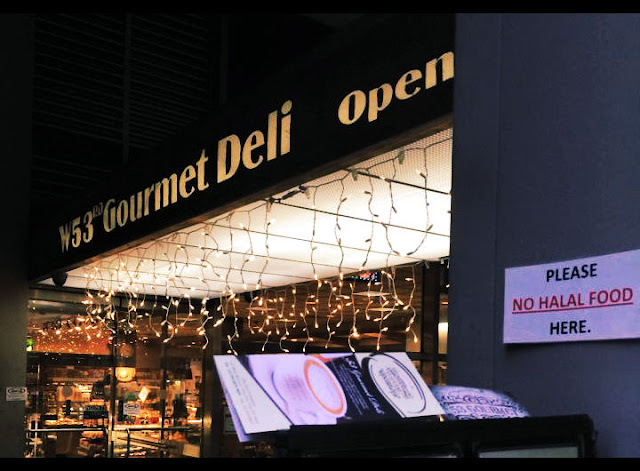 But then I realized that they had a few tables outside and inside, and people probably bought their plates of food at The Halal Guys and took up space at their restaurant, prompting the sign. We laughed all the way back to the hotel. I would eat this again, and if I was in NYC I would probably eat this every other day. Yes it wasn’t blowing my taste buds to smithereens but at the same time it was a yummy, comforting, and filling meal for $7 that you can pick up on the way to all your sights and activities on a tour of NYC. I await Toronto’s new restaurant excitedly! Thanks for the food, Guys! 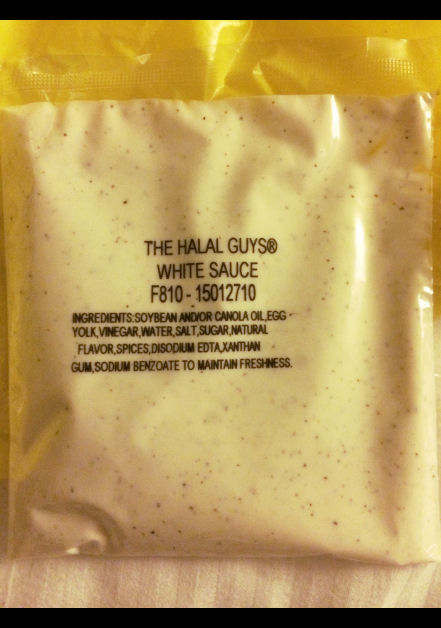 Question for our readers: Tell us of your experience with The Halal Guys! If you haven’t tried it, will you be going to Toronto’s upcoming restaurant? Let us know below or on Facebook!